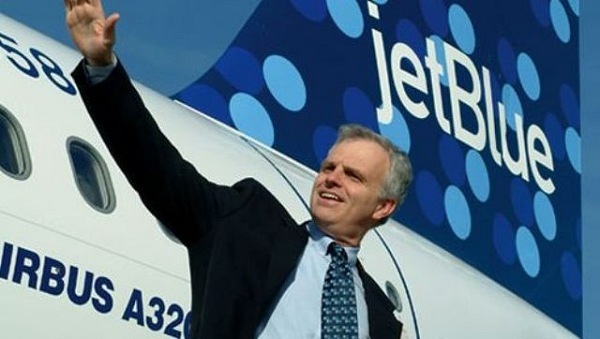 The new U.S. airline being planned by JetBlue founder David Neeleman isn’t expected to start flying until 2021, but it could break new ground in the aviation business. Neeleman didn’t really comment about the venture when news of it first leaked out last spring, but he’s talking now – and he sees bright prospects for his concept and little worry about seeing it crushed by much larger, more established competitors. “I doubt we’ll have a single route that has any competition,” Neeleman was quoted as saying this week. He spoke to a private corporate group in New York, but a couple of media members were present, and his remarks were reported by the travel news website Skift.com. 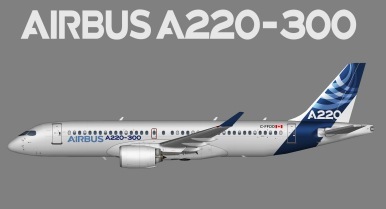 Neeleman’s planned carrier will use a fleet of single-aisle Airbus A220-300s – formerly designated the CS300 before Airbus took a majority stake in Bombardier’s production of its new line of single-aisle jets. And Neeleman said it will operate on international as well as domestic routes, focusing on secondary airports and city pairs that currently have no non-stop service. The planned airline is currently using the name Moxy, but he said that is likely to change before it starts operating. (That would preclude a trademark challenge from Marriott, which has a Moxy hotel brand.) “I could call this airline ‘Crap’ and people will love it because of the way I’m going to treat them,” Neeleman reportedly said, adding that the carrier will “get you there twice as fast and for half the price” compared with existing air travel options. His fledgling company has already ordered 60 A220-300s for delivery starting in 2020 and has an option for 60 more to follow starting in 2025. Compared to their predecessors, the new planes have a longer range, are more fuel-efficient, and incur lower maintenance costs. The A330-200 is designed to carry 130 to 160 passengers, but Neeleman noted that he could decide to install lie-flat business class, extra-legroom and regular economy seats on some planes, presumably those on longer routes. He noted that the aircraft can take off from relatively short runways and “can fly for 11 hours.” Airbus says the A220-300 has a maximum range of 5,920 km, which equals 3,678 miles. That’s a bit over the air distance between New York and London, which is 5,637 km., or between Miami and Brasilia at 5,658 km. Neeleman suggested that in addition to domestic city pairs that have no non-stop airline service, the new company could fly from cities in the northeastern U.S. to Europe, staying away from existing hubs; and that it will operate from Florida to South America where it will link up with the route network of Brazilian carrier Azul, which Neeleman started 10 years ago. Azul flies to 100 destinations in Brazil and also to Orlando and Ft. Lauderdale. The new airline will probably base its “technology hub” in Salt Lake City, he said, and will save on labor costs both in customer service and at the airport by relying on non-verbal processes. For example, “You won’t be able to speak with us” on the phone, he said, but passengers will be able to chat with customer service staff through their phones, and airline reps may place a return voice call to a customer back to resolve an issue. He said flight bookings, changes, and even ordering meals will all be done through an app, and flight check-ins at the airport will be done through the passenger’s phone. “I don’t think people want to stand in line to talk to someone,” he said.